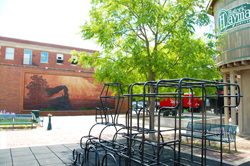 If you didn't know there were parks in Downtown Lincoln, don't feel bad, you are not alone. Many have walked through, or even sat down for a quick bite to eat in a Downtown Lincoln park without knowing it. They may not be your typical wide open meadows, towering trees and jungle gyms that readily come to mind, but each one has a unique feel and beauty. The newest and least traditional of downtown’s parks, Tower Square functions primarily as an art plaza, playing host to everything from rock bands to visual displays to yoga classes. A work of art itself, Tower Square is noted for its beautifully laid brick rings, multicolor tri-beam stage fixture and literal centerpiece, Ascent Tower. 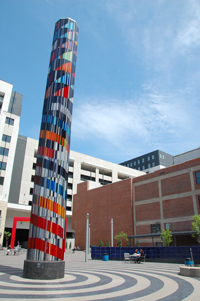 Designed by artist Jun Kaneko, Tower Square may be art, but is still a park with open space and plenty of tables and chairs for a relaxing lunch on nice days. 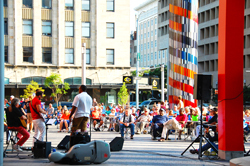 Tower Jazz is an annual concert series at Tower Square. Piggybacking off Jazz in June, Tower Jazz continues jazz music into July. Every Tuesday at 6 PM you can visit Tower Square for a lively jazz concert sponsored by the Downtown Lincoln Association. The former site of a railway express building, Iron Horse Park is downtown’s smallest and perhaps most active park. Located within the boundaries of the Haymarket Farmers’ Market, from May to October Iron Horse is the setting for an array of musical and performance groups. Notable features include the carved brick mural from sculptor Jay Tschetter, “Iron Horse Legacy”, the water tower, a train shaped jungle gym and the CB&Q 710 locomotive, originally built in 1901. In taking care to recognize its railroad history, Iron Horse Park is a unique location, offering respite and play where once there was the bustle of trains. Government Square Park sits next to the old federal building, now known as the Grand Manse. It is a quaint green space with flower beds, benches and drinking fountains. A perfect spot for getting lost in a book, soaking up the sun’s rays, or just letting those drunken noodles from Blue Orchid settle. 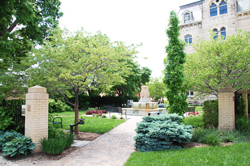 Created as a gift to the community by the Lincoln Community Foundation, the Lincoln Foundation Garden is a popular lunch spot for many with its serene ambience, close proximity to The Original Korn Popper, and free wi-fi signal. Offering seating, tables, plenty of shade, and a unique fountain, the Foundation Garden is a well loved Lincoln destination. In the summer months (May-July) family friendly music is brought to The LCF Gardens. The LCF Gardens Performance Series is every Wednesday from noon-1 PM. 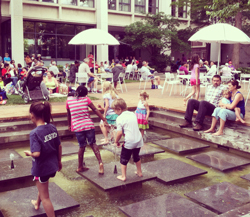 Free music and laughter spice up the lunch hour for downtown residents and employees along with some splashing of water from kids playing in the fountains.